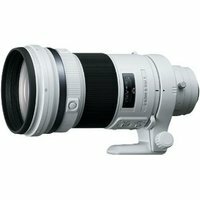 The Sony 300mm f2.8 G SSM II Lens is a fast, prime lens ideal for sports, wildlife and more. Thanks to its large, bright maximum f2.8 fixed aperture you can ensure great low light performance and beautiful images with a shallow depth-of-field and smooth, natural out-of-focus areas. The Sony 300mm f2.8 G SSM II lens features a Super Sonic Wave motor for quiet responsive autofocus, a lightweight design with detachable tripod mount and special sealing against dust and moisture.